The beautiful Hunter Valley, or as most liked to call it: Wine Country, is home to many wonderful sights and activities. Deciding what to do when there are so many amazing options, can be very overwhelming. That’s why we’ve created this holy grail list: The 10 best things to do in the Hunter Valley! This list contains something for everyone! Whether you like to relax, be adventurous, drink, eat, explore… No matter what age or gender, we promise we have covered all bases. Boutique wineries, Hunter Valley Gardens, hot air balloon riding, the best cheese & chocolate you’ll ever taste, the list of things to do in the Hunter Valley really is endless… Which is why we’re about to give you the most informative, insightful & useful list you’ll see all week. You’re going to want to bookmark this bad boy! 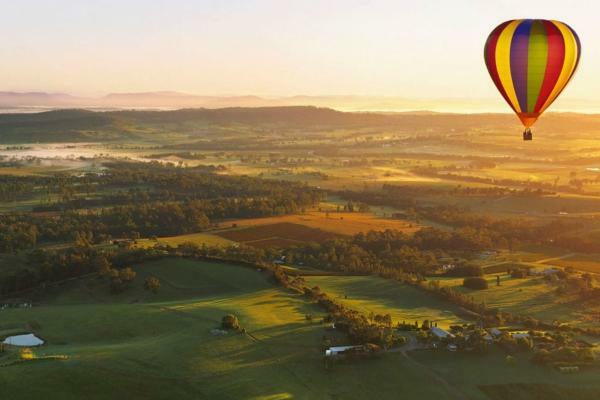 The Hunter Valley is an amazing sight from the ground, imagine just how spectacular the sights of the Hunter Valley Gardens and Wineries are from up in the air. A hot air balloon ride alone is an experience, but a hot air balloon ride over the Hunter… well, experiencing the spectacular views is magical! If you’re planning to take a sunset ride or go into the air during sunrise, we guarantee you will be blown away! 2) Wine, wine & more wine with a Hunter Valley tasting tour! What’s the best thing about the area? Most would argue the amazing wine it produces. Did you know it is not only New South Wales’ but also Australia’s oldest wine region? Whether you adore an oaky red, or prefer a crisp white – the wineries in the Hunter Valley have you covered! 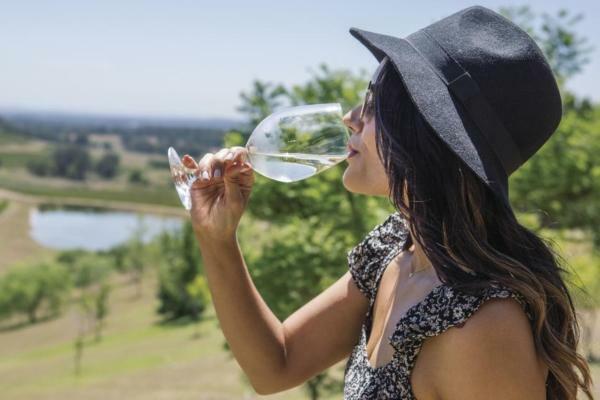 Spend the day taking in the sights of the beautiful boutique wineries and cellar doors, while you sip on the delicious and oh-so-delightful wines that are on offer. There is not a single vineyard we don’t like but we do have a few favourites… and we promise to take you there on our day trips and private tours! 25 acres of pristine gardens that are sure to impress! These gardens are home to 10 impressive feature gardens, that are a whimsical experience for anyone who can appreciate the beauty of nature. Wind your way through trees, bushes and lush greenery along the 8km walk, that is wheelchair friendly! Once you’ve taken in the sights of the Hunter Valley Gardens, don’t forget to check out the Hunter Valley Village which offer a range of boutique and specialty stores. 4) Wine & Cheese – A match made in heaven! We all know cheese is the perfect pairing with a lovely glass (or bottle) of wine, and the Hunter Valley boasts an array of cheese connoisseurs. The Smelly Cheese Shop, the Hunter Valley Cheese factory or Hunter Valley Resort are among the top places to visit in the Hunter Valley, if you’re a true cheese lover! Whether you love to rock out to some classic rock, groove to R&B or admire classical opera – the Hunter has it covered! Concerts are great at the best of times, but can you imagine listening to your favourite artists in a setting as breathtaking as the Hunter Valley? Concerts are definitely something to consider when planning your trip. If you can time it right, it’s sure the be up the top of your list of things to do! The title might say tasting, but we all know you’ll be buying. Chocolate is irresistible at the best of times, but once you’ve tried the divine (and very addictive) chocolate made in the Hunter Valley, there’s no going back. Check out one of the 3 outlets supplied by the Hunter Valley Chocolate Company, and thank us later! Sure, there are so many activities in the are that are fun and delicious, but what about the sights? Putting aside some time to explore the greater region is a great way to truly appreciate what it has to offer. The gravel roads that take you up to the Pokolbin Mountains, will lead you to a magnificent view you won’t forget. With areas like Lovedale, Singleton, Cessnock and Pokolbin there’s so much to explore! You can even go for a scenic drive along Tourist 33 for the best views of the Hunter Valley, and take in the beauty of the surrounding national parks! Whenever you travel anywhere, it would be a crime not to check out the local markets – especially when the produce quality is as fresh as the Hunter Valley’s! There are a vast range of markets to entertain, delight and surprise anyone who attends. Whether it’s the Handmade In The Hunter Markets in Pokolbin, Wollombi Markets, or Sunday Singleton Markets – if you love amazing food, and can’t go past a great deal – the Hunter Valley markets are a must-do. All that eating, drinking and having a blast is sure to take it out of you. If we had a favourite saying (and we do), it would most definitely be (and most definitely is): TREAT YOURSELF. You deserve to be pampered, and trust us the spa’s in the Hunter Valley are jaw-dropping. You will feel like King or Queen when you receive your service from one of these divine and top quality establishments. With some many awesome things to do, it was hard to conclude this list but this final item is a gooden! Everyone loves animals, and everyone loves the Hunter Valley. What happens when you combine the two? You get the Hunter Valley Zoo, of course! At $29 for an adult and $15 for a child (children under 2 are free), you really can’t pass up the opportunity to see all the animals on offer here! African wildlife, Australian wildlife and even encounters with the gorgeous Meerkats! We know you’ll love this place, so check it out!